Buckets. 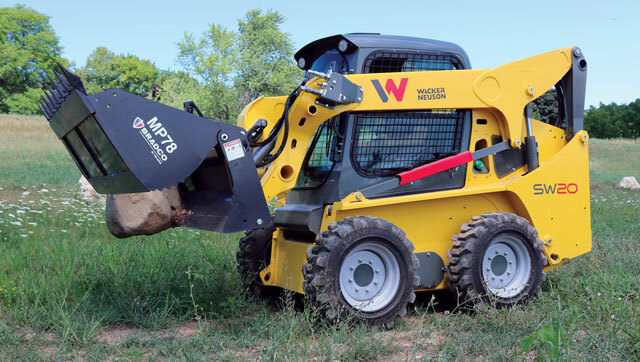 They may seem like the most common, mundane attachment for a skid steer or compact track loader — like they’re a one-size-fits-all, pretty-much-perform-the-same-kinda-work-type tool. Wrong. Every project has its own requirements, so it only makes sense for there to be different styles of buckets to meet those needs. From general purpose, low profile and rock to snow, auger and stump removal, buckets are engineered for a variety of applications. So which bucket goes with which project? Well, let’s find that out. 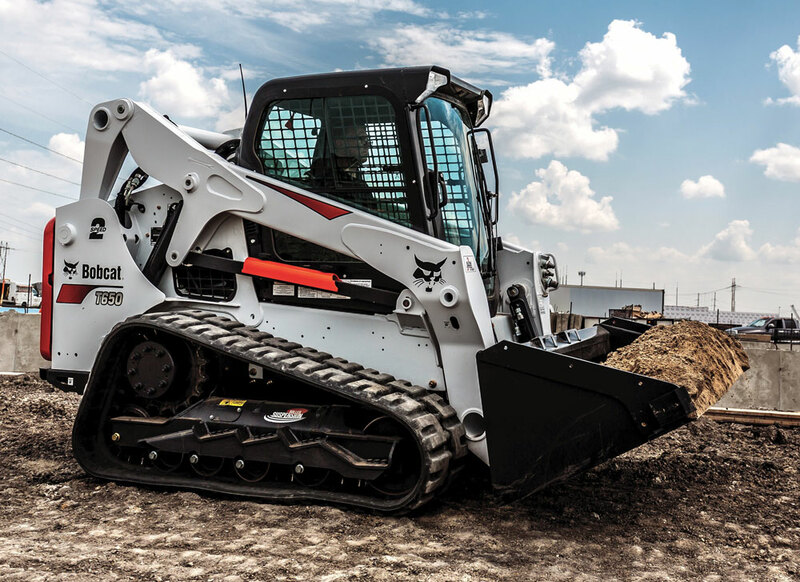 “When looking for a loader bucket there are some things to consider to make sure the bucket is a good fit,” says Christopher Girodat, marketing manager for Bobcat Co. “Start by looking at the bucket weight, capacity and width to ensure the bucket will work with the size of machine you have. If you are working with different types of material, you need to look at a bucket based on the heaviest material you will handle. So, what kind of buckets are out there? Construction/industrial (C/I) buckets can be used for everything from tough digging to material handling. These range in widths from 56 to 80 in. “Construction and industrial buckets offer fair cutting-edge visibility and excellent bucket breakout force for better digging and easier bucket filling,” says Girodat. Heavy-duty buckets lend a tough hand in tackling harsh jobs. These robust buckets are built to handle extreme jobs and are usually used in construction and industrial applications. “It is critical in the harshest of applications to ensure the best and most reliable heavy-duty style bucket is used, and this is especially essential for track loaders due to their high tractive efforts,” says Kelly Moore, product and training specialist at Manitou North America. Grapple buckets grab hold of materials such as scrap, debris or even downed trees and move them around the jobsite. Some manufacturers sell dedicated grapple buckets; however, Bobcat offers industrial and utility grapples as add-ons to its buckets. Combination or four-in-one buckets provide operators of all sorts — from construction and landscaping to agriculture and grounds maintenance — the ability to perform a variety of tasks with one bucket. Combination or four-in-one buckets provide operators of all sorts the ability to perform a variety of tasks with one bucket. “A four-in-one bucket can be used as a bucket for loading, carrying and dumping, as a grapple for handling odd-shaped objects or for dozing, leveling and spreading material with the clamshell open,” says Girodat. Low-profile buckets are constructed with a longer bottom and are a popular choice among landscapers. This particular style of bucket works well in leveling and grading applications. Rock buckets offer the perfect solution for construction and landscaping contractors handling rocks and debris. Girodat points out that this type of bucket features tines that scoop and retain unwanted objects, rocks and debris while the soil sifts through, helping to easily separate materials. Bobcat sells rock buckets in 62-, 68-, 74- and 82-in. widths. Snow and light material buckets are ideal for handling large, low-density materials such as snow and mulch, says Girodat. He adds that they boast high backs to help push snow and straight sides to cut through piles of snow and mulch. These are used primarily in snow, ag and landscaping applications. If work calls for a bucket beyond what’s mentioned above, don’t worry — manufacturers have you covered. According to Moore, specialty buckets come into play when the jobsite demands a different style and design of bucket. Different manufacturers make a variety of these unique buckets. For example, Bobcat offers fertilizer and grain buckets which are a good option for moving large volumes of granular material. Girodat says that these buckets also provide minimal spillage thanks to an increased roll-back feature. 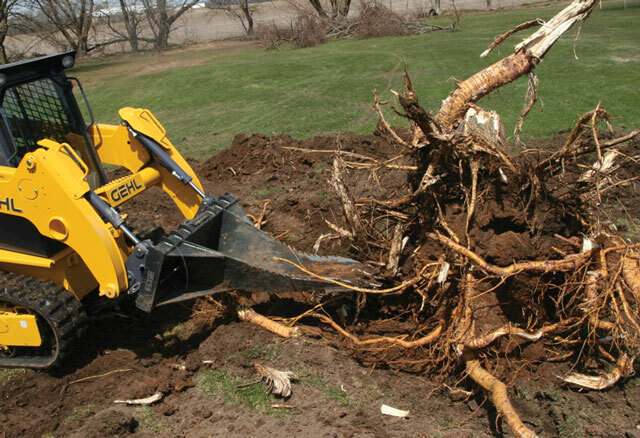 EDGE manufactures a stump removal bucket perfect for landscapers and other operators in need of quickly and easily removing tree stumps and roots. The bucket’s three 23-Series cast steel teeth boldly cut through roots and assist in removing stumps. EDGE’s stump removal bucket is perfect for landscapers and other operators in need of quickly and easily removing tree stumps and roots. John Deere recently released its new roll-out bucket offerings with three models: the RB72, RB84 and RB96. Compatible with Deere’s G-Series compact track loaders, the new buckets work off of the machine’s hydraulics to roll out and dump materials at higher heights. These models offer an additional 34 in. of dump reach when fully extended. Danuser’s Mega Mixer is a unique bucket designed to scoop, mix and dispense a wide variety of materials ranging from bag-mix concrete to livestock feed. Introduced in 2017, the Mega Mixer features a robust design, built-in cutting edges and two auger options — all-steel and rubber flighted. “Whether an operator chooses to go with an all-steel or rubber flighted auger option, the Mega Mixer has the performance to handle a variety of materials, saving the operator’s time on the farm or jobsite,” says Glenn Danuser, the company’s co-owner. Danuser also manufactures an auger bucket ideal for mixing, transporting and dispensing various materials from wildlife seed and sand to gravel and concrete. According to the company, its auger bucket has a quick-attach mount on both sides to control the discharge from the left or right and comes complete with a 2- and 3-ft chute, 7-ft hose and couplers.